Together with Aalto University and Forenom, ONNIVATORS invites families with children (and all young-minded adults who have a sweet tooth for Easter eggs, too!) 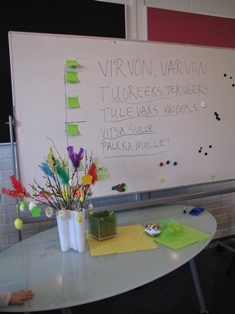 to Design Factory to prepare for traditional Finnish Easter activities. This event is an annual tradition initiated by Melis, a founding member of ONNIVATORS. We decorate willow twigs, enjoy snacks and rehearse the rhyme children chant when whisking willows at neighbors’ doors on Palm Sunday. Please sign up by paying a small fee to cover for material and servings costs HERE. You can also sign up as member HERE.